Coconut Therapy for Pets delivers everything it promises. The book attempts to dive into the health and well-being of pets, and what pet owners can do to promote these, and it does so masterfully, sliding into the water of the topic with grace and barely a splash. Throughout its pages, the book offers any reader greater, impact-full knowledge of nutrition, pets, themselves, and, of course, coconut. Dr. Bruce Fife, the author, first challenges our understanding of nutrition. America has been taken with a low-fat craze, and this attitude has seeped into what we eat and how we think about food. Fat is bad, we hear, and in our fear of being fat, we have cut out as much of the food from our diets as possible. Yet we continue to grow fatter. Coconut Therapy shows that a low-fat diet is as bad for our pets as it is for us. Dr. Fife explains that fat is a form of energy for our bodies, like protein or carbohydrate. When we deprive ourselves and our pets of this nutrient, we restrict proper cell formation, and the absorption of key vitamins and minerals. The solution to creating healthy bodies, whether human or animal, is not less fat than we are currently consuming, but more. In our anti-fat mentality, carbohydrates have robbed fats of their place, and they must be returned to proper prominence. However, the pet foods produced and widely consumed are not high in fat. This book exposes them as being full of carbohydrate fillers that take up space in pets’ stomachs but do little to nourish them. The fats that are included are rancid, that is, rotting, and do more harm than good. What can a well-intentioned pet owner do, then? This book carefully lays out the steps necessary to improving a pet’s diet, as well as ranks various different types of pet foods so that any pet owner can make an informed decision. The ingredient labels on the backs of cans and bags don’t help. This book shows us exactly what those strange compilations mean, providing a means not only to understand the ingredients but also to understand what help or harm the ingredients may deliver to our pets. Beyond stressing a different focus in diet, Coconut Therapy for Pets expounds on the many benefits of coconut, from helping nutrient absorption and managing weight to speeding the healing of cuts and returning dry skin or flaky beaks to their usual luster. Primarily the focus rests upon coconut oil, although briefly coconut water, coconut milk, and coconut meat are also touched upon. This book shows the wonderful benefits pet owners can reap for their furry, hairy, feathered, or hooved friends with the use of coconut oil. However, much as it sounds like a magic bullet to cure any and all diseases, symptoms, or ills, Dr. Fife stresses that coconut oil is at its best efficiency when coupled with the right diet, which he carefully and thoroughly explains. Coconut oil is not a catch-all or a cure-all, and if certain nutrients are lacking, there is only so much it can do. Coconut oil can stave off the worst effects of a bad diet and lifestyle, but it can be truly life-changing – and life-prolonging – when used in conjunction with a good diet. Coconut oil’s many benefits have many causes, one of which is its composition, which the book describes in such a way so that even someone with the least proclivity towards scientific explanation can understand. Yet the text is not over-laden with confusing explanations or minute specifications. Rather, a large bulk of the text is comprised of testimony after testimony of pet owners happily reporting the successful use of coconut oil. Some pets were on death’s door and knocking hard. Some exhibited strange behaviors. Others were pronounced incurable. Still more had the characteristics associated with “normal” aging – a general slowing down, failing to recognize their owners and even behaving hostile, experiencing a loss of house and litter box training. For all of these things that pet owners have typically, but sadly, waved the white flag of defeat to, a means of combat is now offered. And it doesn’t come in the form of expensive drugs or restrictive, repetitive treatments. It comes from a round, brown fruit. It comes from coconut. The book advocates coconut oil for everything from parasitic worms to cuts to dementia to that strange little bump that won’t leave your cat’s chin. Amazingly, both the science and the experience of many people support these claims. Dr. Fife lays out the specific ways in which it helps each problem so that a reader may understand why coconut oil is effective, and then he includes real world examples so that a reader may understand the wide range of coconut oil’s effectiveness. Another particular aspect of this book is that Dr. Fife supports natural cures over and against anything processed. Those that are skeptical about what could sound like hippie nonsense needn’t be worried. Dr. Fife well-establishes the benefits of all-natural cures and diets. Half of the danger of processed, chemical cures is that one doesn’t truly know what he is putting in his mouth. The other danger is the artificial additives that neither our bodies nor those of our pets have been designed to handle. To live off the land, as opposed to off the factory, is proposed to be a much more effective choice. Coconut oil, as a natural product that has been recognized for its remarkable benefits by our ancestors and traditionally-eating people both, fits the bill. Coconut oil, as the book professes, may be taken orally, applied generally, or applied topically. If your pet has a cut, an application of coconut oil will speed healing and prevent infection. Ingestion will add a rich source of fat to the diet and will kill internal parasites. A good rub-down with coconut oil coated hands will relieve any skin irritation and return sheen to fur, hair, or feathers. No matter what malady your pet suffers from, Coconut Therapy proves with every chapter just how much coconut can help. Even if nothing specific plagues your pet, the simple addition of the oil into your pet’s diet can change them dramatically for the better. Your pet may have a dull coat, an allergy coaxing it towards excessive scratching, or a lethargic spirit and you might never know it until you try coconut oil and see results to the opposite. All one needs to bring to this book is a desire to care for her pet better; Dr. Fife supplies the rest. He gives any reader a knowledge of the benefits and multi-faceted uses of coconut oil, teaching pet owners how to solve the problems they identified and the problems they never knew were there. He shows how to increase one’s pet’s overall health and how to both retard and prevent conditions that were previously thought to be inevitable and untreatable. 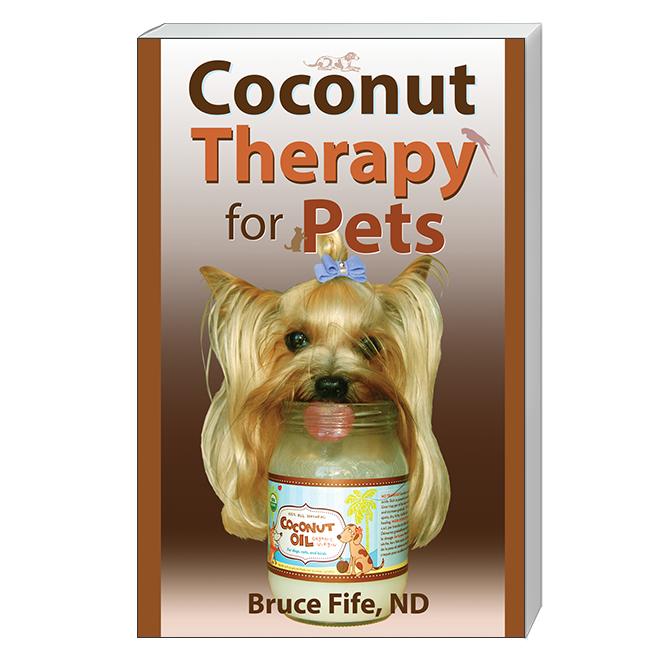 If all readers apply what they learned in Coconut Therapy for Pets, our pets will live longer, happier lives with less disease, degeneration, and pain. Dr. Fife dares you to try coconut oil for yourself, and Coconut Therapy for Pets roves that his words are not an empty claim.